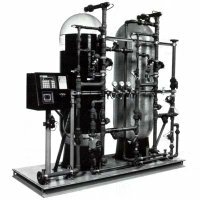 Water Purify System for Industrial Use, Separate Bed Demineralizers Fiberglass Reinforced Tanks 16" to 36" Diameter, Fiberglass Mineral Tanks Twin Alternating 30 to 300Kg - D. I. Engineering Co. Ltd. The cost effective, high performance solution for commercial/industrial applications. Skid mounted, pre-piped and pre-wired for problem-free installation. SCH 80 PVC free piping, with Noryl plastic Y pattern diaphragm valves. HCL regenerated (inducted or pumped). 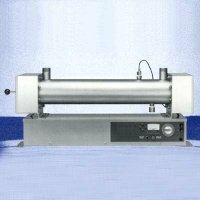 Flow meter with instantaneous readout. Single point power connection (120V). Corrosion and chemical resistant components. 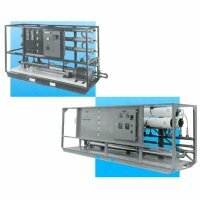 The low cost, high performance solution for light commercial applications that require twin-tank conditioning capabilities. Top mounted Fleck Control System 1" (9000) or 1 1/2" (9500) valves available. Alternating controls, one unit on-line and one unit in stand-by or regeneration. System includes common outlet water meter. Long-life construction featuring brass valve body. Total flexibility in meter and timer setting. Conditioned water used for regeneration. Rugged, non-corrosive fiberglass reinforced mineral tanks from 10" to 24" diameter. High quality blow molded polyethylene brine tanks. 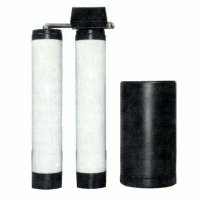 Options are available to adapt these softeners to your specific requirements. Top mounted Fleck Control System choice 7/12 day clock, manual or enter initiated recognition. Solid brass valve body. Diaphragm assist valves allow higher flow rates with reduced pressure drop. 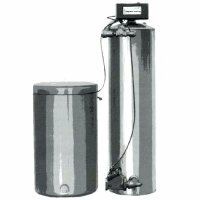 Galvanized steel tanks (lined tanks optional) from 12" to 29" diameter. 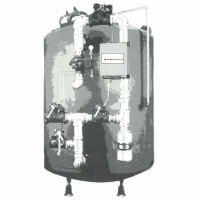 Suitable for use with single or multiple tank systems. A variety of options are available. The cost effective, high performance solution for industrial applications. Diaphragm valve nest design allows each valve to be exactly sized for its required function, providing the most cost effective, efficient and serviceable unit available. Heavy gage steel tanks, 100# working pressure, 150# test. Prime coat exterior (finish coating optional) many lining options are available. 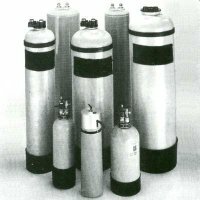 Suitable for use with single or multiple tank systems. systems to your exact specifications.